Garlic is obtained from a perennial plant and is member of the lily family, and relative to the onions. 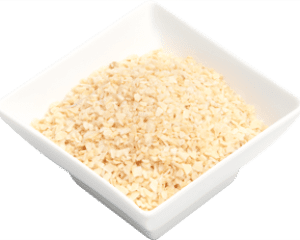 Dried garlic granules have a bitter-sweet flavour and a pungent aroma similar to fresh garlic. However Garlic granules have been roasted and dried and thus have a subtler flavour than fresh garlic.